Jewel Areng is the youngest member of Parliament and is also the only Catholic. He has won in the constituency left vacant after the death of his father. His parent was Minister for Social Welfare and was well respected among Muslims. The local Church hopes the new deputy will follow his father's footsteps and work for the good of the population. Mymensingh (AsiaNews) - Jewel Areng, a Catholic from the Garo ethnic group, was elected to Parliament in the extraordinary election for the constituency of Mymensingh-1, in the north-central part of Bangladesh. He is the youngest member of parliament and also the only Catholic faith, out of a total of 350 MPs. The man is a member Awami League, the ruling party, and is the son Promod Mankin, former Minister of Social Welfare, who died following a long illness. Immediately after the election, the local Catholic Church rejoiced at his victory. Msgr. 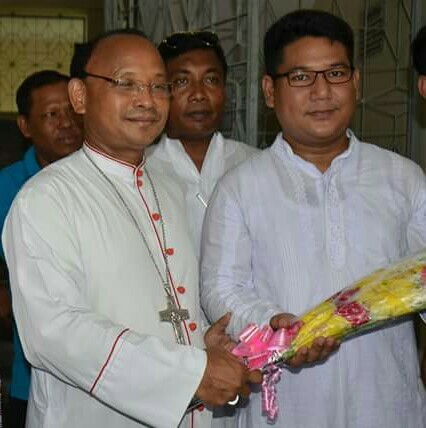 Ponen Paul Kubi CSC, Bishop of Mymensingh, reports that all Christians have supported the candidacy of Jewel and now pray for him, that "he serve the people selflessly." On 18 July, the politician won a total of 170,204 votes, defeating the Muslim challenger Selina Khatun, who gained 14,338 votes. The Mymensingh-1 seat was left vacant after the death of his father, who had been elected for four consecutive terms. The elderly parent was highly respected by the local population, largely Muslim, who awarded his son. Even Christians have committed on his election and have pleaded his case in front of the Prime Minister Sheikh Hasina, leader of the same party. Nirmol Rozario, general secretary of the Bangladesh Christian Association (BCA), reports that he "collected about 500 thousand Bangladeshi taka (5,800 euro) for the election campaign. We wrote a letter to the Prime Minister, asking her to support the candidacy of Jewel Areng. Now we are very happy with his victory and we expect him to follow the ideals of his father and love his people in the same way ". On hearing of the victory, Msgr. Kubi has called the new deputy in person. The bishop says: "I congratulated him and I told him that I hope that he - like his father – attends Mass regularly, as well as carrying out" political activity. In a country battered by attacks by Islamic extremists and fundamentalists who persecute members of religious minorities, now the bishop hopes "that the new leader will help our tiny Christian community in the fulfillment of its functions." There are about 165 million inhabitants in Bangladesh, of which 90% profess the Islamic faith. 8% of the population is Hindu, Buddhist, and the remaining Christian (0.4%, or about 600 thousand people). All over the country there are 45 ethnic groups and half of the Christians belong to indigenous communities.